Unwanted hair is most often caused by heredity and PCOS. You can have a skin reaction to certain hair removal methods. Some products are not safe for all skin types and colors. Hair: You can color it, curl it, straighten it, braid it, cut it, etc., but what about unwanted hair? If you have noticeable hair above your upper lip, chin, neck, toes, belly, or even your back you can probably relate. Having to deal with the embarrassment of unwanted hair is no joke. Depending on the amount of extra hair you have, it can range from being mildly annoying to severely distressing. Girls make both male and female hormones, but the amount of male hormones is normally low. If the levels are too high or your body is sensitive to the normal levels, excess hair can grow. This extra hair tends to be coarse and dark. The medical word for too much or unwanted hair is “hirsutism”. Heredity: “Heredity” refers to things about your body that are inherited, or passed along from generation to generation. Girls and women of Mediterranean descent often have darker and thicker hair on their arms, legs, upper lips, toes, etc. Hirsutism also runs in families. Endocrine disorders such as PCOS (short for Polycystic Ovary Syndrome) can cause hirsutism. Girls with PCOS make extra amounts of male hormones called “androgens”. Although all women make both female and male hormones, girls with PCOS make more of the androgens (male hormones). One type of androgen called testosterone (pronounced test-toss-ter-own) is mostly to blame for excess hair in girls with PCOS. Sometimes the cause of extra or unwanted hair is unknown. What are the options for dealing with unwanted hair? There are a variety of hair removal methods ranging from temporary to permanent. The methods vary in effectiveness and cost. Over-the-counter creams such as depilatories work by dissolving the proteins that make up hair. The average cost of this type of product is a few dollars per application. They are the least effective of the temporary hair removal options. Shaving is basically like trimming or cutting the hair. It doesn’t affect hair growth at all. In fact, it’s a myth that shaving hair causes it to grow back thicker. When a hair is cut off it grows back without the fine point, making it feel thicker. 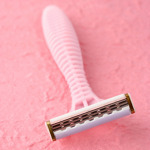 It doesn’t cost much, but shaving can cause ingrown hairs, which can lead to “folliculitis” (inflammation of a hair follicle), ranging from a few red bumps on the skin to a severe rash. To avoid problems, you should always shave in the direction that the hair grows, don’t repeat strokes, and wet the hair or use a shaving cream before you begin. Tweezing is the cheapest method of hair removal, but it can take a lot of time and it hurts, so it’s not a good option for large areas. If you use a decent pair of tweezers, you can pull out the hair at the root, but the hair will eventually grow back at the same thickness. Sometimes girls can develop an irritation where they tweeze which can become infected. Waxing is considered an older method, however soy-based wax is now available. Soy-based wax is better than older waxes because the wax doesn’t stick to your skin, only the hair. Some people feel a sting for a couple of seconds when the wax is pulled off of the skin. Although fairly inexpensive to do at home (a few dollars per application), waxing is best done in a salon or spa where the temperature of the wax is controlled so there’s less of a chance of burning your skin, which can cause scarring. Since waxing removes the entire hair root, your skin may get pink or red and feel tender. You should apply an antibacterial lotion after each treatment. Laser treatments can be pricey and take 6-8 sessions on average for 80% improvement in permanent hair reduction. This method destroys the hair, not the root. The hair doesn’t come out right away, but it eventually falls out. This method lasts a longer time but the hair eventually grows back. Electrolysis is the only permanent hair removal method, because it destroys the hair follicles. This procedure needs to be done weekly and it can take a couple of years for permanent hair removal. Therefore, it can be very costly. Bleaching hair isn’t the same as removing it, but it’s a popular and inexpensive way to make dark hair on the places such as the face, arms, and neck less noticeable. Be aware though, that bleach is a chemical which can cause irritation and burns. Medications that lessen hair growth: All of the options listed below require a prescription. All of the oral medications take 6-9 months for you to see an improvement. Birth control pills are typically prescribed to treat PCOS. The Pill is used to make the menstrual cycle regular and balance the hormones. The levels of androgens (the male hormones linked with excess hair growth) are lowered. Metformin is a medication that is often prescribed to help lower insulin levels in women with PCOS. High levels of insulin stimulate the ovaries to make androgens, so by decreasing these levels, hair growth can be lessened, but not as much as with the Pill. Spironolactone is another medication that is often used to treat hirsutism. It works by blocking androgen hormones from working. Possible side effects can include; irregular periods, frequent urination, loose bowel movements, rash, dry mouth, tiredness, and headaches. The side effects are temporary and go away when spironolactone is stopped. Vaniqa® is a topical cream that requires a prescription. It works by slowing the rate of hair growth. It’s safe to use with oral contraceptives. The cost of the cream may vary depending on your health insurance coverage, but is usually not covered. Vaniqa is recommended for small areas such as the upper lip, chin, and side burns, but would not be practical for use on large areas of the body. You have to use it every day for it to work. Is it safe to remove unwanted hair? Having to get rid of unwanted hair is definitely something you’d rather not have to deal with, but there are safe ways to make it go away, at least temporarily. It’s still very important to be aware that certain methods of hair removal are NOT SAFE for all skin types and colors. You’ll need to talk with your health care provider first and then test a small area before applying the hair removal product on larger areas. There can be different reasons for unwanted hair growth, so be sure to talk with your health care provider. Reactions such as scars and burns can be far more unsightly than hair. That’s why it’s very important to talk to your health care provider first, and then find out about local salons and spas that are well thought of in your area and offer various services.